The festival of lights, Diwali is just a couple of weeks away. And since gifting forms such an important part of the festival, shopping for the best Diwali gifts is mandatory. Apart from gifts for your friends, family members, relatives, and beloved one get Diwali gifts for your professional allies as well. Gifting them will encourage employees to work smartly, help you build better professional relations; it might as well establish you like the best boss ever. Gone are the days when you had to go to your local store to get your Diwali shopping done. Online Diwali shopping is a convenient way of purchasing gifts this Diwali. Also, online gifts stores provide a wide range of Diwali gifts at affordable prices and fast delivery. Based on your need and budget, choose from the best corporate Diwali gifts ideas to gift your employees, bosses, suppliers, colleagues, clients, and workers. These days, utility gifting is more important and gaining momentum. Gifts that can be used at home or at the office and can be reused are becoming popular. Keychains, diaries, pens, headphones, notebook, power bank, Bluetooth speakers, smartwatches, smartphones customized corporate Diwali gifts, electrical appliances, paintings, crockery set, decorative diyas are the trendy gifts. For the traveling bosses or traveling colleagues, travel storage bags are a good idea. These reusable bags will help them be organized. Get it personalized to make a better impression. There are other personalized Diwali gifts that you can choose from. Personalized desk stands, personalized pens, personalized shirts or personalized mugs, use a personalized gifts delivery to get these delivered anywhere in India. 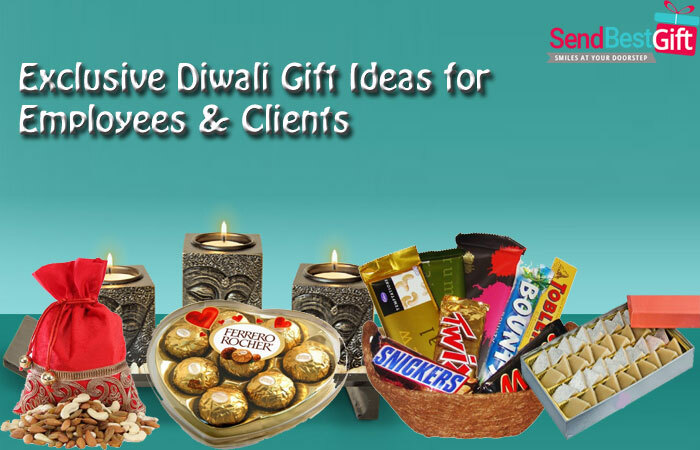 Choosing from the best Diwali gift ideas for clients is very important as they are the most important asset to you. Popular gifts include mobile phones, gift cards, crockery sets, travel bag, golf stick, and travel bags. Customize the gift to make it thoughtful and woo your clients. While clients are important, employees are the reason why clients come to you. And that makes it necessary to gift them the best Diwali gifts for employees. Diwali gift hampers, dry fruits, Lakshmi Ganesh idols, cardholders, clocks, crockery set, and Bonsai plants are the way to go. Your employees could certainly use power banks, smartphones, speakers, desk lamps, cooling fans, and smartwatches. Know any fitness freak client or be that an employee? Get any good fitness band and help them be the best version of themselves. Not just a great Diwali gifts for men, fitness bands are a great gift for your female clients and employees as well. Corporate gifting, to gain business or build the relationship with people around with which we deal on daily basis, is gaining momentum. Diwali gifts for clients, a gift for your boss, Diwali gifts for employees or a gift for your potential client, choose gifts wisely and make everyone a part of your extended family. Shop for these gifts at any reputed online gift store and get your gift delivered in any corner of India.